For all its land, Canada is dominated by water. Two coasts have welcomed immigrants: immigrants who have often traveled by water from water dependant nations, such as those of Southeast Asia and the North Atlantic, to settle in new maritime homes. Our east and west coasts today resemble the skylines of Scotland and Hong Kong, respectively, with diets fed from the fruit thereof. It is no coincidence that one Canadian province is named New Scotland, and that Chinese boat races are a major event in Vancouver. We are water people, east and west. For those living away from the coasts, water has also been the lifeblood – and sometimes the bringer of destruction – to life in our fair land. It was the waters of the St. Lawrence that formed the highway of commerce in our early history, along with Hudson’s Bay. The Great Lakes formed the frame of the necklace which would boast the largest concentration of families, farmers, and industrialists in the country. The rivers of the prairies would become critical bringers of life in their abundant harvests, but would also visit doom in time of drought or flooding. 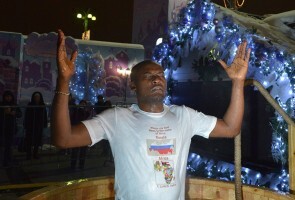 And in the north, whole cultures existed and exist around the waters that interconnect them, waters which offered a conduit for missionaries like Sts. Juvenaly and Innocent and their companions in the north, even to the Yukon Territory. Like the highways of Rome, water was the means by which the Gospel first penetrated the far north of our continent, planting roots which still flourish today. Canada boasts one of the largest fresh water supplies in the world, so it is no surprise that the sale of water came to dominate the Free Trade debate of the late 1980s. Water was once again a defining feature of Canadian culture and history. 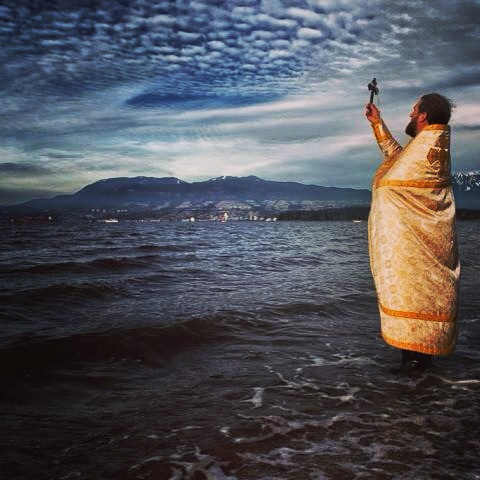 Despite division by two calendars of the celebration of the Lord’s Theophany, Orthodox Christians in Canada are in a unique position to witness and serve at the Great Blessing of Waters, on the shores of waters that reach across most of the world. Just as Our Lord entered and sanctified the waters of the Jordan River at His baptism, so too can the Church today extend this sanctification, even simultaneously, across the largest land mass in the world, from Pacific British Columbia (touching the Alaskan Orthodox heartland of North America, as well as Russia), to the Atlantic provinces (touching the European roots of Canada, and the Mediterranean roots of the Orthodox Faith), to the waters of the north, down to the rivers feeding the lakes, small and Great, in the south. Regrettably, because of the winter cold and the general unwillingness of Canadians to stand beside a chilly lake in January, the Great Blessing of Waters is usually served indoors, within the nave of the church – the nave itself being a symbol of the great Ark of our Salvation. 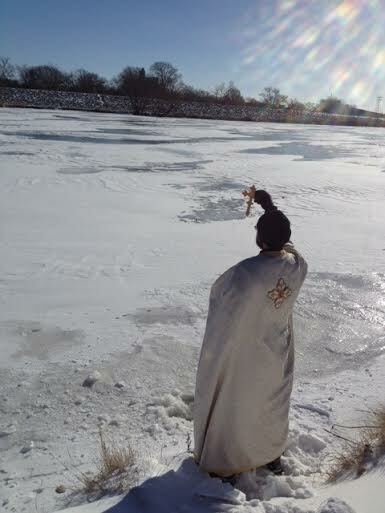 Yet for those brave souls who would venture outside to the bodies of waters that refresh our land, we dip the Holy Cross into the same same Jordan River today, once again sanctified by Christ, now in our land. 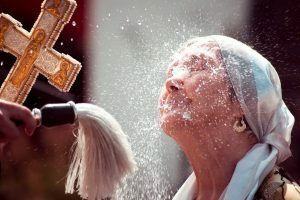 If Canadians can gather together in the cold with hot chocolate and coffee – the quintessential posture of our countrymen for sporting events, sleigh rides, and those parades honouring a caricature of Saint Nicholas – would it not make sense for Orthodox in Canada to do a very Canadian thing, and march down to the nearest body of water on the Feast of Theophany, and ask the Lord’s blessing on it? What better way is there to reclaim the waters of our land for Christ, waters He created, waters He parted, waters through which He brought the Ark when they covered the whole face of the earth, waters in which He was Himself baptized, and in which we are baptized, too? One priest opined that we should be blessing the local civic reservoirs, so that the blessed water might flow through the taps of our city water systems. Whatever the waters we may bless, let us be bold about reclaiming Canadian waters for Christ, not in a post-modern neopagan environmentalists sense, but in the same sense intended by the founders of our nation, who prayed that Christ would have His Dominion, from sea to sea.